Keep warm on colder evenings with this powerful, 1500W ceiling mounted patio heater. 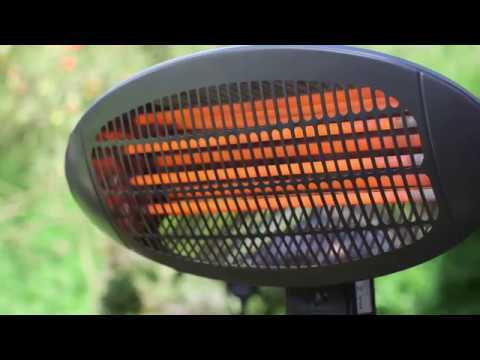 If you enjoy relaxing in the garden, then this patio heater will help you to make the most of covered outside spaces even when the temperature drops. Electric heaters have many advantages; because they don’t have any flames or burn oxygen they are much safer then gas heaters or fire pits and can even be used indoors. In addition to being safe they are also a source of light and heat a wide area; they are silent and virtually maintenance-free. The powerful heater has a heat setting of 1500W, perfect for keeping you warm whenever the temperature drops. Constructed from durable steel, this heater is sturdy and safe, and even comes with an added pull switch for easy operation. Quick to heat up, the ceiling mounted patio heater is the perfect addition for covered outside seating areas, gazebos, eaves or summer houses.